The Trudeau government is taking on the four provinces that have resisted its federal carbon pricing plan by promising $2 billion in annual rebates to offset the costs. But the federal Conservatives and the four premiers against the tax have called the move an election ploy and a tax grab, and vow to keep fighting. 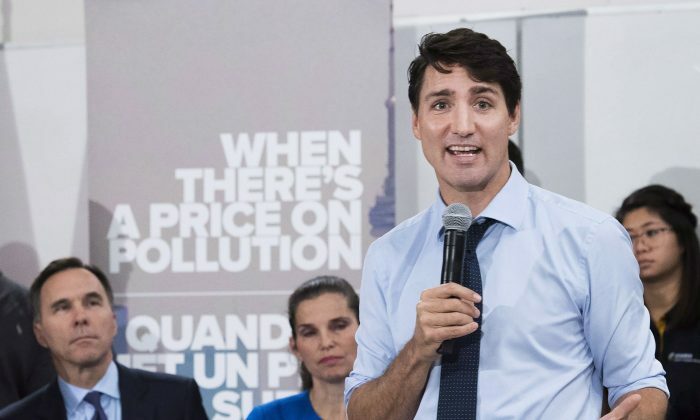 Prime Minister Justin Trudeau said it will no longer be free to pollute in Canada and a tax on carbon emissions is the best way to combat climate change. He made the announcement on Oct. 22 in the riding of carbon tax foe Ontario Premier Doug Ford in north Toronto. But with an election due just a year from now, the Liberal government is facing a combined attack from Ford, Saskatchewan Premier Scott Moe, and other conservative politicians against a tax they say will hurt families, the elderly, and small business, and do little or nothing to help the environment. Conservative Leader Andrew Scheer called it an “election gimmick” and said his party will scrap the tax if they get elected next year. Moe said in an Oct. 23 press conference that Trudeau’s plan wouldn’t work for Saskatchewan for various reasons and his government will continue fighting the federal carbon tax in court. Ford criticized the plan as an election ploy and said he’s prepared to take Ontario’s ongoing legal fight against the tax to the Supreme Court if necessary. Under the new plan, the government will charge Ontario, Manitoba, Saskatchewan, and New Brunswick $20 per tonne of greenhouse gas emissions starting April 2019, rising by $10 each year until it reaches $50 a tonne by 2022. The other six provinces have already complied with Ottawa’s carbon pricing mandate of a minimum of $20 a tonne, and each will have its own separate tax scheme implemented by Jan. 1, 2019. Trudeau said 80 percent of families in the four provinces will be better off as a result of the annual rebates that range from $300 in Ontario to nearly $600 in Saskatchewan. “That may please some people but I’m not sure how it will work if they are already running a deficit twice as large as they have promised and have a pipeline they weren’t planning to buy,” said Aaron Wudrick, federal director of the Canadian Taxpayers Federation (CTF). Wudrick said the CTF opposed federal carbon taxes from the start and helped make it an Ontario election issue last spring by having all four Conservative party leader hopefuls sign on to scrap the previous government’s carbon tax. He said he plans on being in the middle of the debate next year when the federal election heats up. Wudrick added that if Alberta’s United Conservative Party leader Jason Kenney wins the provincial election next spring it could be “the final nail in the coffin” for Trudeau’s carbon tax strategy because it would tip Canada’s population to the majority being represented by opposing provinces. For Kenney, Wudrick, and those against carbon pricing, the higher taxes will not adjust behaviour in a significant enough way to get people to use less carbon emissions. “Most Canadians don’t live in downtown Toronto or Vancouver, they can’t ride a bike or switch to public transit, so if you start raising the cost of something like gasoline, people get upset,” Wudrick said. Marco Navarro-Génie, president and chief executive of the Atlantic Institute for Market Studies, described Trudeau’s plan as a consumption tax in the guise of helping the environment. “It’s a tax grab because they are unable and cannot demonstrate that the carbon tax at the rate that it exists and would be implementing would actually detour people from producing greater emissions,” he said. Navarro-Génie notes that even at the eventual $50-per-tonne rate for carbon, it won’t come close to meeting the reductions set for 2030 at the 2015 Paris Agreement to at least 30 percent less than they were in 2005. “We have to stop the zealotry and become more practical and become more focused on resolving the problem rather than appearing to solve the problem,” he said. Critics also argue that even if the country’s emissions were reduced to zero, Canada accounts for less than two percent of total global emissions, so the issue needs to be addressed on the global stage. Opponents and experts are anticipating a long battle ahead, with Saskatchewan already taking the issue to Appeals Court and Ontario filing its own court case, and potentially Alberta taking a similar approach if Kenney wins. Greg Poelzer, a political science professor at University of Saskatchewan, said he believes Moe may have a legitimate case when he argues that it is identified through the constitution that one level of government is not able to tax another level of government, and that you can’t tax some provinces and not others. But Saskatchewan will have to wait until next spring for the province’s Appeal Court to hear its constitutional challenge to Ottawa’s carbon tax. Poelzer expects the government to drag it out until after the election and avoid multiple court cases with multiple provinces. Opponents point to Australia as an example of how a carbon tax failed. After coming into effect in 2012, the tax was axed in 2014—along with the federal government—after becoming wildly unpopular. But Poelzer uses Sweden and Norway as examples where a carbon tax has been successful at lowering emissions while keeping the economy chugging along. He warns, however, that Canada hasn’t been clear with its strategy and can’t afford to take a “cookie-cutter approach,” with carbon taxes in each sector being the same. He explains that Norway, for example, has a $78-per-tonne rate in the petroleum sector but an $8 rate for fisheries. Something similar would be necessary to protect Canada’s agriculture sector, he said.